With the Brexit dust settled, where does Gibraltar stand? So, now the dust has settled where does Gibraltar stand? I’m talking about Brexit of course, and the conflicting views as to whether Spain actually gained anything from its eleventh-hour strop that threatened to derail last Sunday’s European summit at which the draft withdrawal agreement and the political declaration for the UK’s future relationship with the European Union were endorsed. 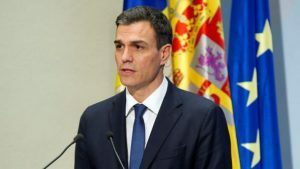 On the eve of the summit, Prime Minister Pedro Sánchez grandly announced that he was lifting his so-called veto on the talks taking place because he’d extracted “historic” and “transcendental” concessions that would eventually lead to the resolution of the 300 year old dispute over Gibraltar, no less. In truth I was a little concerned as I heard him live on television, and there are reasons to be wary. 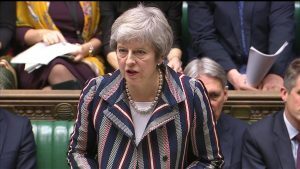 If, against the odds, the House of Commons approves the withdrawal agreement, there’ll be a transition period after which negotiations will enter the “future relationship” phase. At that point Spain would indeed be able to block any trade deal. Not arising out of anything that happened last weekend, but because future EU/UK agreements require unanimous approval. Each member state, not only Spain, would thus have a veto. Some commentators have been highly critical of what they see as a British climbdown. Writing in The Independent, Sean O’Grady says “the fate of Gibraltar – constitutional, economic and political – is now subject to a foreign power with the force of the EU behind it”. Meanwhile the chairman of Lawyers for Britain, Martin Howe QC, considers that prime minister Theresa May’s “loud and voluble protestations that she will protect Gibraltar from Spanish incursions into its sovereignty are completely worthless, because she is handing to Spain the legal power to insist on its terms for Gibraltar as its price for allowing the UK to escape from the disastrous (Irish) backstop Protocol”. It was concerning, too, to hear European Commission president Jean- Claude Junker say that the EU was “with Spain”. If that’s true today, how much more so will it be the case after the UK leaves the club and he no longer has to carry out a balancing act between two of its members? 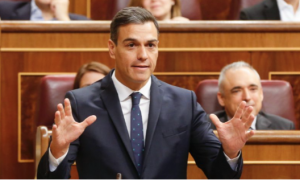 Nevertheless the EU declined to reopen the negotiations, as Pedro Sánchez would have liked, to insert a clause giving Spain the power to veto the application to Gibraltar of any future agreement between the EU and the UK. For all his bluster and bravado, the legally binding withdrawal agreement remained unaltered as did the political declaration. 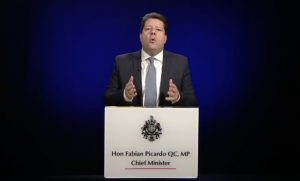 As chief minister Fabian Picardo pointed out in his televised message on Sunday night, “Spain has had to accept a clarification which does not have the weight of legal value that it sought”. And he dismissed declarations that the Spanish premier said he’d agreed with other member states as “pieces of paper that will have no legal effect”. My initial worries were also substantially allayed when I saw the reaction of Spain’s opposition parties and much of the press. For the PP, the agreements are “shameful” and “a historic failure”, while deploying a footballing analogy, Ciudadanos leader Albert Rivera said Mr Sánchez had taken his eye off the ball and conceded a last-minute goal. Most of all, Theresa May has been steadfast and resolute. 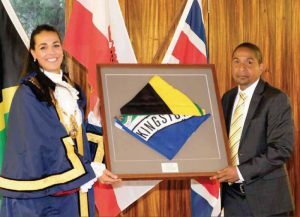 “Our message to the people of Gibraltar is clear”, she told MPs on Monday. “We will always stand by you. We are proud that Gibraltar is British, and our position on sovereignty has not and will not change”. For now, that’s good enough for me. 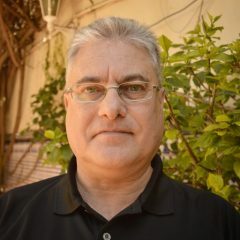 Author gibstevePosted on 30th November 2018 Leave a comment on With the Brexit dust settled, where does Gibraltar stand? More than thirty countries around the world have legalised the use of medicinal cannabis, from Australia to Argentina, Italy to Israel. The UK has now joined them. 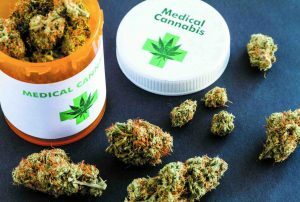 As of 1st November nearly 80,000 specialist doctors in England, Wales and Scotland are allowed to prescribe unlicensed medical cannabis that, in normal circumstances, would be illegal (because they contain THC, the major psychoactive constituent of cannabis – what gives users their “high”). This is not the case in Gibraltar. Here clinicians have recourse to just two cannabis-derived medicines that, until recently, were the only ones authorised in the UK: Nabilone, a synthetic cannabinoid used in the hospital to stop vomiting in patients undergoing chemotherapy and Sativex, a spray that may only be prescribed by a neurologist or specialist in the management of multiple sclerosis. Nabilone is neither routinely prescribed nor stocked in Gibraltar, while just five GHA patients are presently being treated with Sativex. Should we emulate the UK and make more cannabis medicines available on prescription to more people, with more diverse conditions, like chronic pain or epilepsy? 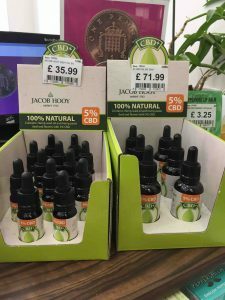 Local campaigners say we should, and that the government ought to start by allowing doctors to prescribe CBD oil. Not to be confused with cannabis oil, which remains illegal, CBD oil contains less than 0.3% THC and is not psychoactive. It’s widely available over the counter in pharmacies and health stores but is expensive. A 30ml bottle of 2.75% strength CBD costs £47.99 in Holland & Barrett while the 5% flask will set you back £71.99. Not everyone can afford it. There’s little doubt that legalising medical cannabis would be a popular move. 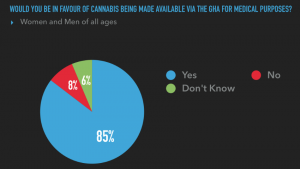 An overwhelming 85% of respondents in a February 2017 survey conducted by GBC were in favour of it, while more and more people have been taking CBD oil since its use was authorised just under a year ago. Don’t take my word for it: Holland & Barrett told me that despite the cost, it’s their best selling product. An interesting development in the UK is that, with the advent of medical legalisation, public opinion has shifted dramatically in favour of the full legalisation of cannabis. Whereas in May, support and opposition were almost even at 43% and 41% respectively, a Populus poll last month found that 59% of the British public would now support cannabis being legal for both medicinal and recreational use. Only one third of the population think the sale and possession of the drug should remain a criminal offence and an online poll calling for cannabis to be made legal for medical and recreational purposes attracted more than 25,000 signatures. Curiously the cited GBC poll yielded the same narrow 2% difference as last May’s UK survey, with 46% against full legalisation and 44% in favour. We can’t know whether making cannabis legal for medical use in Gibraltar would result in a dramatic change of attitude towards full legalisation as seems to have occurred in Britain. But supporters of medical cannabis will be hoping the government decides to cross that bridge if and when it comes to it. 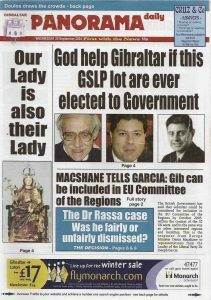 Quite a few years ago, in the pre GSLP/Liberals Alliance days, the Panorama newspaper ran a front-page headline that read, “God help Gibraltar if this GSLP lot are ever elected to Government”. It would be the perfect headline today with “PP” in place of “GSLP”, as a return to office by the Partido Popular in Spain would surely set off alarm bells locally. 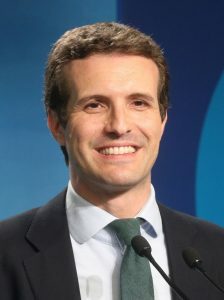 Under new leader Pablo Casado the party has moved further to the right from where Mariano Rajoy left it. Renowned political philosopher and author José Luis Villacañas says Sr Casado’s discourse incorporates several of the reactionary tenets of the Spanish right, including an emphasis on Catholicism, the secondary role of women and a stress on the unity of the Spanish nation, while for historian Antonio Elorza, Sr Casado represents the comeback of the reactionary PP typified by a heavy hand in Catalonia and repressive legislation. Emboldened, our old foe José Manuel García- Margallo has even tried to dust down his unwanted joint sovereignty proposals. Despair not though dear reader! The latest opinion poll by the Centro de Investigaciones Sociológicas, the Centre for Sociological Studies (CIS), suggests that the PP and Sr Casado have their work cut out if they’re to oust the socialists at the next general election, due by July 2020 at the latest. The poll has the PSOE on 31.6% support compared with 18.2% for the Partido Popular, which has Unidos Podemos snapping at its heels less than one percentage point behind. The not-so-“Populares” have actually slipped to third in the rankings behind Ciudadanos who are on 21%. Taken together the centre-left, with 48.9% support, is nearly ten points clear of the centre-right (39.2%). Meanwhile, asked whom they would prefer as their prime minister 25.8% of respondents chose the PSOE leader and present incumbent Pedro Sánchez. 16.9% went for Albert Rivera of Ciudadanos, while Pablo Casado and Podemos leader Pablo Iglesias were neck and neck on less than 11% each. So should Sr Sánchez, who heads a minority government, call an early election? The answer is … probably not. The CIS polls aside (September’s also gave the PSOE a big lead), most others are much tighter, and one actually had the PP ahead. And the CIS’s credibility has been questioned because the new boss, José Félix Tezanos, is a former PSOE federal executive member who was reluctant to step down when he was appointed to the CIS in June. Detractors say his methodology gives the PSOE an unfair advantage and therefore skews the results. 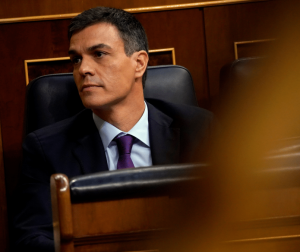 Nevertheless the overall trend indicates growing support for the PSOE at the expense of the PP, which may incline Pedro Sánchez to bide his time. The Catalan crisis also urges caution. From Gibraltar’s point of view restraint is a good thing. A strengthened socialist government with a fresh four-year mandate would doubtless be welcome. But the prospect that Spain might change horses in midstream and elect a hardline PP or Ciudadanos administration, with Brexit looming, just doesn’t bear thinking about.